Trying out new stuff is a hobby of mine, and although I get to do that a lot via the blog, some stuff I try out just doesn’t warrant its own full blog post. Thought I’d share my recent favorites in posts like these – let me know what you think! I’ve been reading a lot about cushion foundations and BB creams and since this one is readily available in drugstores, I thought I’d give it the ol’ testaroo. I’m really self-conscious about the dark acne scars I have on my cheeks from a recent bad breakout, so I like to wear at least a little something to help them blend in with the rest of my face. With a cushion foundation, you just use the included puff to press into the foundation-soaked sponge, and then pat it over your face to apply. I wear it in shade W5.5 and I think it’s a pretty good match. Like I said, it’s not full-coverage, but that’s what I wanted. It’s a great medium-coverage foundation for every day wear! Plus it’s super travel-friendly. I got mine at CVS, but you can get it for almost $5 cheaper on Amazon here. I entered a contest at Fitfluential and won this awesome essential oil diffuser and a set of essential oils to go with it. I’ve never had a diffuser before, but as a not-very-secret hippie, I am completely delighted with it. You just add water and several drops of any essential oils you like and it steams them into the air. My apartment smells like patchouli heaven. Guys, I’m so excited to finally have my own place again I could scream. 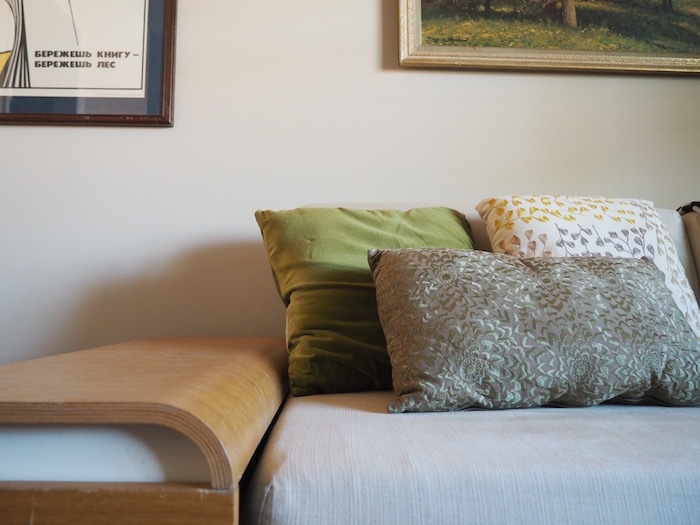 If you want to see some more pics of my digs, check out this recent post! 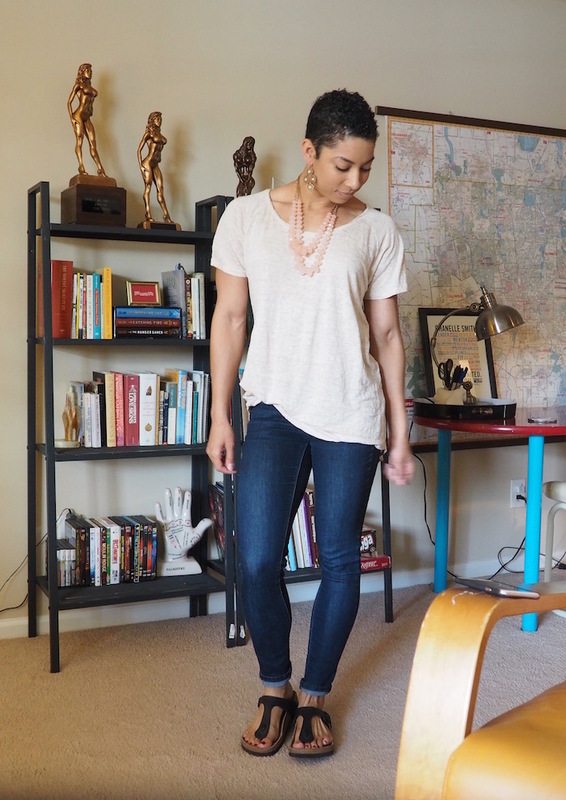 I hate fussy clothes, and since I don’t have to get dressed for an office job workin’ for THE MAN anymore, I’m always looking for versatile neutral tees cuz they go with everything. I worked with Orvis for a post recently and happened to pick out this linen blend tee and it’s quickly become my new faverino. Get it at Orvis here! Mine is in the color Sand, size Large because I like my tops oversized. I don’t know if I’ve talked about my love for Spotify on the blog before, but it is one of my desert island must-haves. I listen to music ALL. THE. TIME. and I pay the $10 monthly for the premium service so I don’t have to listen to ads, can skip unlimited songs on radio, and can download songs and listen offline if I know I won’t have data somewhere. ANYWAY, Spotify has a playlist that automagically populates weekly with songs it thinks you’ll like, and it’s incredibly on point. A couple of weeks ago, it popped the song Turn Your Love by Half Moon Run on mine and now I’m obsessed with this band. Check out my three fave songs by them: It Works Itself Out, Call Me in the Afternoon, Turn Your Love. Not sure what’s gotten into me tbh but I have been wanting to drink coffee in the afternoon lately. (Psychological productivity something something.) Which is a bad idea if I want to get any sleep at all that night, so I’ve become a decaf drinker. Shame me all you want, but YOLO. What have your faves been so far this spring? My faves this spring have been all of the blooms all over the place! Thanks for sharing at Merry Monday this week. I want to try the foundation. It looks great! That makeup looks awesome. I have been looking for a good coverup! My favs for spring…green grass, sunshine and leaves on the trees! Decaf Coffee! Oh, my word! Just kidding! I do the same thing, for some reason drinking coffee in the afternoon relaxes me enough to get me through the rest of the work I need to get done. I’ve recently become a fan of decaf coffee, too! It’s so good to be able to drink coffee in the afternoons without being up all night. i was wondering how that foundation was. good to know! It would be so great to have some of these in the house! I have to try that L’oreal. it looks like it has good coverage. I have to get one of those essential oil diffusers. I’ve been really working on my essential oil collection and I’d love to have my room smelling like lemongrass all the time. I really love your April favorites! I love essential oils but I don’t own a diffuser yet! Well, it something to look up. Amazing personal style and the photo from your new apartment is gorgeous. Cheers! I just got a few diffusers. My youngest had a cold. He highjacked one of my diffusers. We like Peppermint a lot at our house. I recently purchased some oil and now I’m thinking about getting an oil diffuser. I think that might be just what I need. I can’t do decaf with my toddler 😉 but I love that Orvis tee! Yes, a few of these are going on my list. I keep saying I’m going to pick up an oil diffuser. By the way super cute stuff from Orvis. Lately I have been lovin this water enhancer I got from Sams Club. It gives you healthy energy and makes you feel good. Chasing after kids all day I sure need a boost. I have been lovin’ my diffuser too. Not only do I love adding scents to a room (and enjoying the benefits), but also the color-changing lights. Could hear from here that scream re the new apartment. Would feel the same if i hava a new place. Congrats! Yes… You have such great taste! The apartment looks so nice! I like diffusers! I didn’t know the now brand. That foundation looks lush on you! I really wanted to try oil essentials. Congratulations to your new apartment. The foundation looks quite good and the oil diffuser sounds great too. The oil diffuser, new apartment, and other things in this post are really, really nice. I love them all. Chic. I almost picked up the cushion foundation yesterday..totally regretting not buying it now! That essential oil diffuser is stunning! I love diffusing essential oils for not only the wonderful smells but for the health benefits as well! I use NOW essential oils all the time. And I’m totally digging your new top! I am all about trying different flavors of essential oils as they bring a different atmosphere to your living place with those pleasant smell & I would want one such diffuser at home. The Lumi Cushion looks great & I think you have got some great results out of it. I just got an essential oil diffuser and I am so excited to try it out. What are some of your fav oils? Can’t do without my coffee fix, but I do try and limit it to just mornings. Having your own place is one of the best feelings, enjoy! This post is so full of goodness! Congrats on our apartment:). i’ve been seeing essential oil diffusers everywhere and I really want one now! Also checking out that band as we speak :). Happy May! Enjoy your new apartment. We just moved into our new house and we are still adjusting. I will be investing in some essential oils for our home. Congrats on moving into your new place Chanelle! I know what its like to want to move out of the ‘rents house and have your own. I love your little quirky hand collection that different! Enjoy your space! This foundation really does provide really good coverage. It doesn’t even look like you are wearing any makeup after you apply it. I love essential oils! I love the way they make a room smell. It can change the way you feel when you walk in a room and it has a pleasant aroma. A great read here. I don’t have caffeine and I think it’s a great thing for me. I love your photos and great to here you have your own place! There is something so exciting about having your own place. I don’t think that I could live without caffeine. I’ve already given up sugar and cigarettes so I’m all tuckered out. I love the oil diffusers, and your apartment is really nice. Congratulations on the new apartment! I love my oil diffuser too, it’s pretty much constantly going! I love using BB creams. Congratulations! I know how exciting it feels to have a place you can call your own. The diffuser looks fantastic, and it blends with the over-all theme of your apartment. You were lucky to get all those essential oils! It must be so relaxing to have scents like those welcoming you home everyday. Congrats on your own place again there is nothing more freeing that than that! Sounds like a great month congrats on the essential oil win as well! I love, love, love my oil diffuser. It’s my new favorite product and I don’t know why I never had it in my life before. You’re is very nice. Your apartment looks nice. You look so comfortable in that outfit. Congrats on your apartment! That is a cool aroma air diffuser! I’d love to get one like that! I too love spotify, but I can’t stream a lot of music anymore due to my line of work and all the bandwith I use. Congrats on the apartment 🙂 Today marks 2 years that I’ve been in my new home. I know how exciting that can be! I remember when I first moved into an apartment back in the day, it was so much fun decorating my new pad and making it my own. Now I have the kiddos, so I think the move is way more fun for them than me 😉 Loving your place, you seem happy!! I love your linen blend tee and congrats on getting your own apartment. It looks great! I”m lusting after the essential oil diffuser. It looks amazing. Congrats on your new apartment! Moving into a new/your own place is always such a new adventure. So far my favorite things this spring has been traveling to Paris and the GORGEOUS weather. I loveee that foundation, it’s my favorite!! That diffuser is absolutely gorgeous! That would fit so well in my kitchen! I love to diffuse oils when our home starts to smell like dog or someone cooks something nasty! lol. I usually burn tarts, but I am loving the looks of that oil diffuser. I may have to hint on that I’d like to try one of those for Mother’s Day! moving into a new space is a fun adventure… my favorite part is decorating it to make it feel like home! Haha I just recently watched that episode of Broad City lol I love now essential oils and that diffusion is on my wishlist! Moving into a new place is so exciting. I don’t know if could drink decaf coffee, I always need the caffeine. My new favorite thing has been walk around the neighborhood on my lunch break. It is nice to get outside for an hour each day. I love my essential oil diffuser too! They are amazing aren’t they – I have a couple now one which I use with strong minty scents and the other for lighter ones. Lovely new things! My diffuser just broke and I’ve been on the hunt for a new one. You look amazing too! The foundation looks awesome! I’ve been debating on an diffuser, maybe one day! Congrats on moving into your own place!! I have seen that cushion foundation advertised and I was wondering about it. Now that I see how well it covers, I am going to have to try it. You look great! You are so lucky to have won those oils! There are so many uses for them. I was lucky enough to be gifted some peppermint oil. Great for headaches. Love all of this but most of all the coffee. I have a thing for espresso and after 2 it’s decaf for me! The outfit looks great and you do too!!!! That linen tee is super cute. I am always on the lookout for high quality basics for my wardrobe! I am excited for you that you moved into a new place. I remember the first time I moved into a place by myself it was so exciting I love being able to decorate it anyway I wanted to. I also love that shirt and I like everything oversize myself. I am just starting to look into essential oils. I think I would greatly benefit from them. I have the same issue with the coffee in the afternoon. I just found a decaf that I like a lot (Tully’s). Actually Tully’s is what I’ve been drinking too! Love the foundation, I don’t really wear make-up but it’s nice to know my options in case! This is an awesome list and again, congratulations on having your own apartment, that’s definitely one of the best achievements! Thanks for sharing your faves! The top (and the whole outfit) looks great on you! I haven’t used it yet but Spotify sounds like a good service. I currently subscribe to SiriusXM app, which I like, but I can’t choose/download songs. I’m wondering if Spotify might be a good option for me, as I’ll need music for teaching fitness classes? I have never heard of cushion foundation but now I’m intrigued! It looks like the coverage is really good. I’m not sure if they’ll have it in my local drugstore for me to get colour matched but will definitely be keeping an eye out for it! The oil diffuser is so cute. I am not a makeup girl, but my daughter will love the foundation. The essential oil diffuser is so stylish it doesn’t look remotely like one – it can blend into any house. Good win, be the oils smell great as well. I need to try essential oils. I heard they have great benefits. I have been falling in love with essential oils. I love how peppermint and eucalyptus clear my mind and almost instantly get rid of a headache. That powder had great coverage! I love the series of photos you showed.